Wireless LAN purchases aren't exactly going gangbusters these days, but relative to other enterprise infrastructure product sales, WLANs are where it's at. Synergy Research Group's latest figures show that WLAN sales grew 5% over the last 4 quarters vs. 2.3% for 7 segments measured overall (the others being data center servers, Ethernet switches, unified communications apps, routers and the slowest-growers -- voice systems and telepresence). While you might think that the general availability of faster and more flexible 802.11ac Wave 2 products from WLAN market leader Cisco, #2 HP/Aruba and others has sparked WLAN purchases, Synergy Chief Analyst and Managing Director John Dinsdale says that isn't necessarily the case. "Actually I’d say that growth in enterprise WLAN is pretty much technology agnostic," Dinsdale says. "If you look back over the last few years, spend on WLAN hasn’t really bounced as we’ve moved from a/b/g/ to n to ac. Obviously enterprises have demanded (and received) steady improvements in WLAN product performance, but it’s not like there is a big spike in market size whenever products are released that support a new standard. 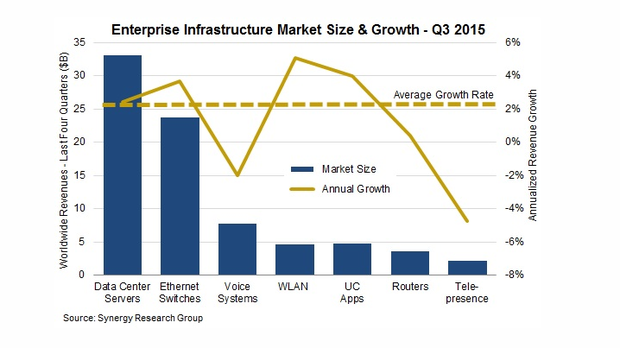 Overall, the market growth curve for WLAN has been pretty smooth." And to put things into perspective, 5% revenue growth over the past 4 quarters is "pretty low by historic WLAN standards," Dinsdale says. The market has matured (as have the other enterprise infrastructure markets monitored) and price competition is strong, he adds. In other words, the modest revenue growth/enterprise spending does disguise stronger unit shipment growth. 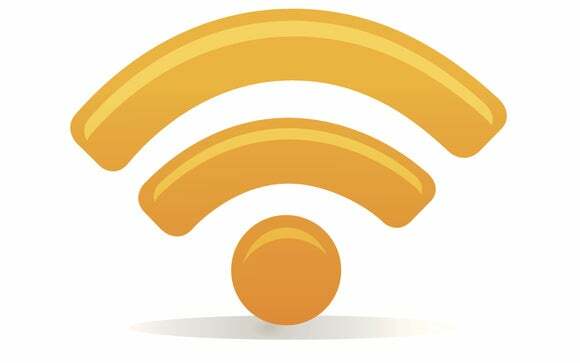 The Wi-Fi Alliance boasted during the big CES show in Las Vegas earlier this month that Wi-Fi shipments have reached 12 billion units to date and that another 3 billion -- including loads of dual-band 2.4/5 GHz products -- are expected to be shipped in 2016 alone. Still, revenue for WLAN and enterprise infrastructure products is being squeezed not just by price competition among vendors like Cisco, HP and others, but also vs. suppliers of cloud/hosted offerings.